Invoices from A to Z: the components of a professional invoice and an overview of a streamlined invoice process. In basic terms, an invoice is a bill sent to your customers after you complete a job or visit. The invoice establishes what services you or your company provided, how much is due and when, and how your customer can pay. Legally speaking, an invoice creates an account receivable. This is a claim for payment for services rendered or goods provided that is legally enforceable. But the invoice process as a whole goes beyond these definitions. Seen another way, invoicing is a way to close out a job or project in a professional manner, that can pave the way for future business. Outside of an invoice’s legal implications, sending invoices in an organized and timely fashion increases your chances of being paid promptly for a job well done and ensures your business maintains a healthy cashflow. It’s as basic as your customer having a paper record of how much they owe you. After all, as the saying goes: out of sight, out of mind. When is the best time to send an invoice? Typically, invoices are sent upon the successful completion of a job (we dig deeper into the idea of invoicing before or after a job in this article). In this case you know the client is happy and that your work on the project is finished or any remaining work has been negotiated under a new agreement. The amount of the invoice will be for the agreed upon amount you indicated in your quote, your total hours billed, or the remainder of an agreed upon amount if your client has paid a deposit already. You can send an invoice by email, by post mail, or have it ready to deliver in person at the end of a job. Take care to find out what format your customer prefers and send your invoice in that manner. Time saving tip: Jobber’s invoicing feature will create multiple invoices for you in a few clicks, email them to your clients or create print labels if snail mail is your thing. However you deliver your invoices, it’s best not to let too much time lapse between finishing a project and invoicing for it. Tardiness can lead to confusion and delays in getting paid. Payment instructions included either on invoice, or in the email when you send the invoice. Specify who to make the check out to, how to process an ePayment (using a feature like Jobber Payments, your clients can pay for their invoice online immediately), or where to call for a credit card payment. 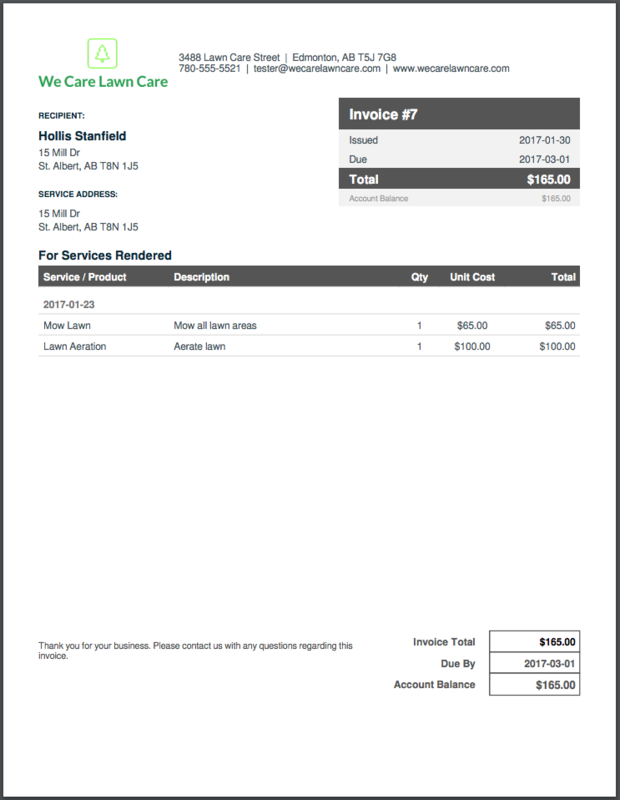 Below is a screen shot of an invoice we formatted in Jobber (Jobber allows you to customize an existing invoice template) so you can see what a professional invoice looks like in practice. So you now have a solid understanding of the invoicing process and the nuts and bolts a professional invoice should include. We have a few tips on how to use technology to make your invoicing process even more streamlined. Using business management software such as Jobber you can streamline your invoicing process and turn hours of invoicing into a 10 minute task with our batch invoicing feature. Jobber also allows you to integrate your invoicing process with an ePayment options like Jobber Payments or Square, so your client can pay the moment they open up your invoice in their email. Even better, ePayment features that securely vault customer cards, like Jobber Payments, allow you to automatically charge a customer for a job well done. This is especially handy when you’re doing recurring work, such as a weekly house clean or lawn mow. Invoice through Jobber and sync with accounting software like Quickbooks Online. This means less time spent manually entering invoice outcomes after you’ve already spent time manually creating and sending invoices.